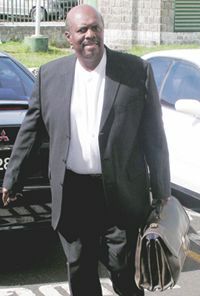 Reflecting on the 2005 financial year during his debate of the 2006 Budget Estimates, Opposition Leader, Arnhim Eustace, said he has no problem with the increases in salaries but has a difficulty with âa reduction in revenue and a very significant increase in expenditureâ. âI have no difficulty with that particular increase because even with that, wages and salaries form 49 per cent of recurrent expenditure exclusive of amortization and sinking funds,â Eustace sighed. He however explained that when looking at the Estimatesâ financial summary for 2006 it is important to look at the revised figures for last year. He noted that the Current Expenditure for 2005 was projected to be $379.2 million. However, the revised estimates for 2005 which are contained in the 2006 estimates show that in effect instead of spending $379.2 million, $398.7 million was spent. He stated that this was an increase of approximately $19 million of the budgeted amount. On the issue of the revenue Eustace said if one looked at the $341 million that was projected for 2005, the revised figure has indicated that $334.6 million is likely to be collected. This, he stressed, indicated a decrease in revenue to be collected. Eustace also argued that for the year 2005 St.Vincent and the Grenadines had a current deficit of approximately $19 to $20 million rather than a surplus. âI raised this because in our minds we have moved on to the year 2006 but we have a record before us which we must also analyze since it has implications for 2006 and beyond,â said Eustace, adding, âThis is not an acceptable state of affairsâ. Dr. Gonsalves responding to Eustaceâs comments, said his administration had put its marker on the ground for all to see. Referring to Eustace, Dr. Gonsalves said, âHe said he has no problem with the increase of wages and salaries. Of course, given his general statement I do not accept what he says because if he was in office we were not going to see an increase of 4.5 per cent this year for the public servants neither were we going to see the hundred per cent increases and more for the forgotten ones,â said Dr. Gonsalves.